Went on a quick over-night backpacking trip in Henry W Coe State Park over the weekend. I haven't backpacked in 8 years and Donna has never been camping, let alone hike-in camping. We had lots of new equipment to test out. We wanted to get into the Frog Lake site but it was already taken so we settled with a very close site called Lion's Spring. It was only 1.2 miles in, the last half of it on a very faint trail down into small canyon and through lots of tall grass. Unfortunately that meant ticks and I had to pull one off when we got to our site. The site is on an incline except for a very small section for a tent. The incline and trees made us feel very closed in, like camping on the side of a hill. It was cozy and secluded, but there was nowhere to walk to except down or up. The spring is supposedly year round and it was trickling nearby. Knowing we had water was nice and I drank our water liberally and re-filled (filtered of course) from the spring. As we got there the flies came out and there was too many of them. Later on the mosquitos came out in droves. Their collective buzzing was amazingly loud. I opted for a sweatshirt even in the heat just to keep them off my arms. We spent the entire night in the tent, only coming out to cook dinner. Sunday was even hotter than Saturday and almost just as many mosquitos. We ate breakfast, packed up, and got out of there as fast as possible. Donna ended up with 20+ bites (big ones too) and I just got a small collection on each elbow (guess I missed a spot with the repellent). Doesn't really sound like a good trip but in reality it was just nice to get away, despite the fact we were confined to the tent and had a miserable time with bugs. 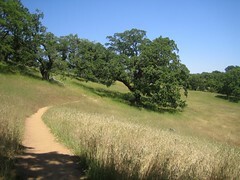 Henry Coe is very dry and very hot and I will avoid the place now that summer is almost here. Maybe in the fall and next spring I'll be back for more backpacking. I can still see mosquitos when I close my eyes.